On Monday, 13 participants came to the rodeo grounds in order to compete for the position of rodeo queen. Competitors from Pinedale and Big Piney were seperated into 3 age groups- junior princess, senior princess, and Queen. 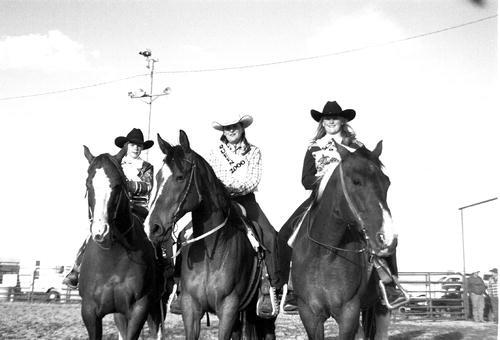 Based on horsemanship, personality and attire, judges Ed Brewer and Sue Ziegler chose Jayme McClean (Queen-middle), Brandi Brown (Senior Princess - right) and Brittani Moore (Junior Princess - left) as the royalty for the year 2000. The queen and her court will represent the Sublette County Sporting Association during three rodeo events Rendezvous weekend.